The constant downpour outside dictates that I must stay in, therefore I must sew! I'm working my way through that stack of fabric that I just cut out. 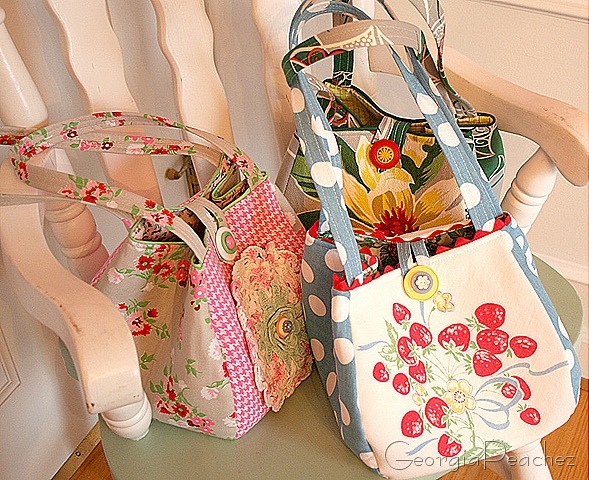 Three purses down, two more to go before I must pull out the fabric and scissors again. We did squeeze in a movie though. Star Trek. Loved it. OH MY GOODNESS!!! I am thinking I need the strawberry one!! Let me know when you plan on putting it on etsy!!! TOOO PRETTY!! This weather is the pits! We drove all the way back from the beach in it and I feel drowned!!! Oh, they’re just adorable! When I must craft, I usually decoupage or work with paper. But there was a day when it had to be fabric! You have an eye for color, the bags turned out gorgeous. Loving these bags!!! Typical me….is there any way to make them just a bit bigger/longer? The strawberry one is great and I love the colors in the other one. You really know what to do with a rainy day. Just beautiful!! Are they for sale in your Etsy shop soon? You made good use of a rainy day! OMG those are sooo cute.